Lord Goldsmith: A court could not deal with it, so I had to clear the decision yes or no. 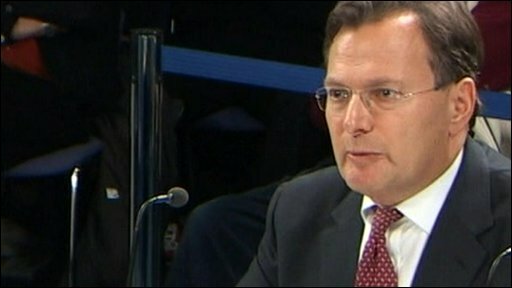 Lord Goldsmith has admitted he changed his legal view of the Iraq war but said it was "complete nonsense" to claim he did so because of political pressure. Until a month before the 2003 invasion, the ex-attorney general believed it was "safer" to get a fresh UN resolution. But he gave the "green light" after deciding force was justified by UN accords on Iraq dating back to 1991. In a day-long Iraq inquiry session he also said he was surprised the cabinet did not want to discuss his advice. Asked why he left it as late as 13 March to issue a definitive statement that war was lawful, he said that was when the military had sought a "yes or no" answer. The military deserved an "unequivocal" judgement on the legality of its action before troops went into battle, he said, although in the past such statements had not been needed. "They were entitled to have a clear view. They weren't to be put in the position of being sent off, maybe it is, maybe it isn't lawful'. Lord Goldsmith's performance was confident and precise. Over the six hours in which he faced questioning, he went to great lengths to lay out the full sequence of events that ultimately led to his final legal advice in March 2003. He did not feel there had been inconsistencies in his evolving views, nor did he believe that the political pressure on the government had weighed on him. Here was a man who was keen to emphasise that he had been a law officer, one step removed from political decision-making, even if he had been a member of Tony Blair's cabinet. In reaching a decision on the legality of the Iraq war, Lord Goldsmith remained the lawyer and Mr Blair was "the client". At times, the exchanges between the former attorney general and the inquiry committee appeared arcane. Who would have thought that, seven years after the infamous UN Security Council resolution 1441, we would be going through it again, line by line, discussing whether there was a difference between "all necessary means" and "serious consequences" (coded language for "the use of force")? "There was no other way of anybody answering that question but me. It was my responsibility... I reached the view that, on balance, the better view was that it was lawful." However, he revealed that he told ministers at the time that the UK could still be taken to court in the event of military action. Lord Goldsmith spent six hours being questioned as the legal debate over the war takes centre stage ahead of Tony Blair's appearance on Friday. Critics of the war have suggested that Lord Goldsmith changed his mind about the issue in the days before the conflict, first issuing draft advice urging the need for a second resolution but a week later concluding that action was justified on the basis of existing resolutions. At the heart of the legal case was how a few words in UN resolution 1441 were interpreted - whether there was a difference between "all necessary means" and "serious consequences", which is coded language for the use of force. He told the inquiry that he was given accounts while in the US of the negotiations and private conversations ahead of the agreement on the first UN resolution which helped sway his view. He was asked if he had asked the French for their view on whether the wording of the resolution meant a second one was needed to authorise force. But Lord Goldsmith said it would not have been appropriate for the UK's attorney general to ask the French for their interpretation given the diplomatic split at the time between Washington and Paris and the message if would have sent to Saddam Hussein if it became public. He also insisted he had not come under political pressure to issue the statement, saying he did not "recall" Tony Blair raising the subject at a key meeting in Downing Street on 11 March. Reports that he had been "pinned" to the wall by Labour peer Lord Falconer, a close ally of Tony Blair, during a meeting on the issue was "complete and utter nonsense". As tensions over Iraq intensified in the summer of 2002, he said he gave "consistent" advice that UN approval would be needed to approve military action and told No 10 that other justifications such as self-defence, prevention of a humanitarian disaster or regime change would not be lawful. Tony Blair did not appear to welcome advice that UN authority was the only way for war to be justified, he told the inquiry. Pressed about whether UN resolution 1441, approved in November 2002 and giving Saddam a "final opportunity" to comply with UN demands, was sufficient to justify war, he said it was never "clear cut" as there were ambiguities in how it could be interpreted. He said his initial view, held until February 2002, was that getting a further resolution would be "safer" as it would put the "matter beyond doubt and nobody could have challenged the legality". But after discussions with US and UK diplomats, Lord Goldsmith said the "true meaning" of resolution 1441 became clear and he said that he was confident that Iraqi non-compliance with this agreement would "revive" the authority to use force inherent in existing UN agreements. In particular, he said it would reactivate UN resolution 678 agreed at the end of the Gulf War which authorised the international community to use "all necessary means to restore international peace and security" in the region after Iraq's invasion of Kuwait. Lord Goldsmith denied that he ignored the concerns of Foreign Office lawyers Sir Michael Wood and Elizabeth Wilmshurst who believed the invasion would be a "crime of aggression" without explicit UN approval. "I paid great attention to what their views were," he told the inquiry, adding that he disagreed with their opinions. But Lord Goldsmith criticised Jack Straw's response to Sir Michael Wood's concerns about the legality of the war in a January 2003 letter in which he said he did not accept his advice. Although ministers were entitled to "challenge" legal advice, he believed the tone of the letter "appeared to be rebuking a senior legal adviser for expressing his own legal view". Throughout the process, Lord Goldsmith said his job was to provide "accurate legal advice" whatever his "private views" on the policy. Earlier during Wednesday's hearing, chairman Sir John Chilcot said he shared Lord Goldsmith's "frustration" at key documents not being declassified. Lord Goldsmith said he did not agree with the decision not to publish some documents understood to relate to the legal basis for the war. Sir John added: "Can I just say that the frustration is shared." It is thought they were referring to a number of documents - which the inquiry panel can see but not make public - relating to the legal basis of the war.